Roosevelt Island Tram in New York is not exactly 100% free, but because most tourists have Unlimited Metro passes, I have decided to include it anyway. A must see! The Roosevelt Island Tram over the East River provides spectacular views of Manhattan, the East River, Roosevelt Island and a peek into the first Spiderman film. The entrance to Roosevelt tram is at 2nd Avenue and 60th Street. The aerial tramway resembles a ski gondola. Walk up and pay with your subway pass. If you have an Unlimited MetroCard, you pay nothing extra. 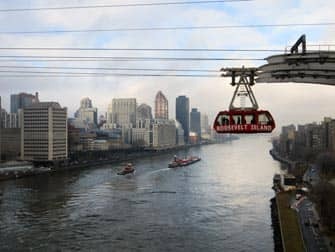 The gondola / tram takes you to Roosevelt Island in four minutes. Roosevelt Island is a small island in the East River. It is a place where about 16,000 people work and live. On Roosevelt Island you can take a wonderful (and a quiet) walk. If you want to do this, then walk to the river and then left. There are many benches and a nice view of Manhattan. Perfect for relaxation. You can use the tram again on the way back, but there is also a subway station just behind the tram between the first apartment buildings. Another option is to take NYC Ferry. You can board on the east side of the island. It first stops at Long Island City and then continues to Manhattan. In 2002 the tram was the scene of the movie Spiderman. In 2010 the entire tram and the cables were replaced and reopened in November 2010. Want to know what to expect? Watch the film of the whole trip (which takes four minutes).